• Watch Jon Stewart's funny litany above of the Republican caucus' humorless hypocrisy. • Rep. Morris “Mo” Udall (1922 – 1998) (D-AZ) served in Congress from 1961 to 1991. A former professional basketball player known for his wit and progressive causes (environment, campaign finance reform, Native Americans, National Parks, etc.) Mo replaced his brother Stewart in Congress. His son Mark Udall is currently a representative from Colorado, nephew Tom is a Senator from New Mexico, and second cousin Gordon Smith served as Senator from Oregon. 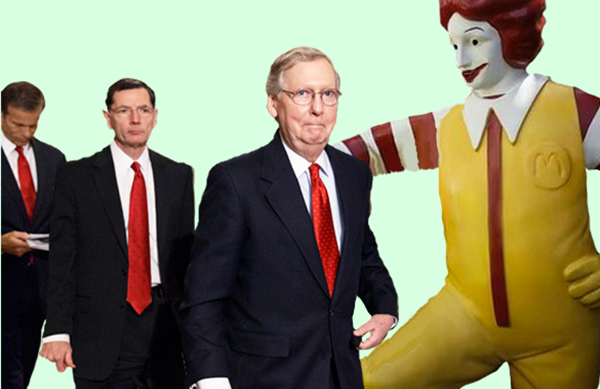 • Collage above: Senate minority leader Mitch McConnell (R-KY) is congratulated by R. McDonald, Director of Families for Lower Wages, after sealing demise of a higher minimum wage. • Having lost a bruising battle to Jimmy Carter for the 1976 Democratic presidential nomination, Udall resisted entering the 1984 race: "If nominated, I shall run to Mexico. If elected, I shall fight extradition."